Imagine: in a controlled trial of high-dose psilocybin, administered to healthy volunteers as part of a scientific research study, affiliated with a prestigious university, and guided by skilled facilitators, two-thirds of participants described the experience as one of the five most spiritually significant experiences of their lives (comparable with the birth of a first child or the death of a parent). A full third of participants reported that the experience was the most spiritually significant event of their lives. Consider: when psilocybin was given to people with terminal cancer, participants typically experienced a decrease or a complete removal of their fear of death. One participant declared of himself, months after his trip and although dying of cancer, ‘I am the luckiest man on Earth’. Both of these studies were published in the Journal of Psychopharmacology in 2016. They represent examples of a quietly resurgent interest in the therapeutic use of psychedelic compounds by mainstream researchers. 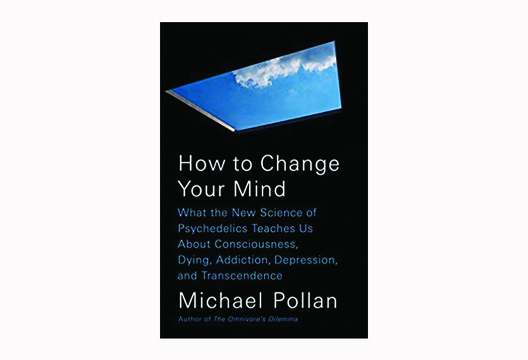 In this excellent and highly readable book, food writer Michael Pollan guides us through the history of psychedelic research, much of it forgotten – a thousand scientific papers were published between the early 1950s and late 1960s, when the compounds were made illegal and so became almost impossible to study. The middle section of the book sees an intrigued Pollan seeking his own psychedelic spiritual experience, vividly recounting trips on psilocybin, LSD, and a terrifying experience on 5-MeO-DMT, the smoked venom of the Sonoran Desert toad, an experience he likens to holding on to the side of a launching rocket, or being a wooden shack that you see getting obliterated in atom bomb test footage. The book ends with an attempt at explaining these experiences, and why they can be profoundly life-changing. Pollan introduces a niche neurological theory, the default mode network (essentially suggesting that our brains get overly rigid in their perceptions of the world and that psychedelics ‘shake the snow globe’) and sticks to vague notions of ego. To my reading, I saw huge parallels with third-wave contextual therapies, particularly ACT, and many of the descriptions of the insights people gained from the psychedelic experience could have been quoted verbatim from an ACT textbook. Pollan’s book poses profound questions for mainstream clinical psychology, not least how to approach evidence like this, and what, if any, role will it have in our future?